Ravin graduated form Ashmead School of Massage in Vancouver, Washington in December of 2002. 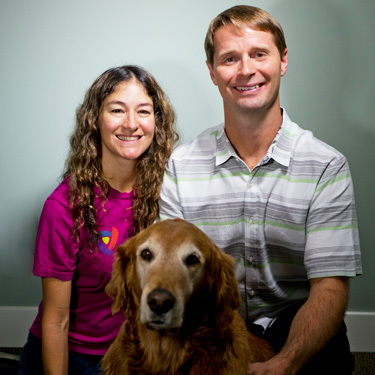 She and Andrew moved to Bellingham in 2007 to practice Massage and Chiropractic together at Atlas. Ravin says that she loves working with her husband, because she knows that when she recommends Doctor Andrew to one of her clients, they will receive the best care possible. I love working with my hands and communicating with people. Massage is a perfect match. Ravin has focused on forming the massage team at Atlas Chiropractic, Massage and Wellness Center and has begun building the clinic’s therapeutic exercise program to bring an even more well-rounded approach to patient care. Ravin and Andrew share their home with their golden retriever Esteban and enjoy spending their time in the snow and hiking around Whatcom County. Contact Atlas Chiropractic, Massage and Wellness Center today to schedule an appointment! We accept insurance and are in-network providers with many plans.